Historically, Mother’s Day involved a mother, her mother, and maybe her grandmother as well. Today, with Facebook, social media, and a multitude of blogs, Mother’s Day exposes us to everyone else’s mother-child relationships. We scroll through our newsfeeds and see photo after photo of mothers and their kids, as well as adult children celebrating their older moms. As a therapist with my heart immersed in the world of those who have experienced many different kinds of painful losses, Mother’s Day highlights a sadness of absence, for the mothers who are grieving a child no longer with them, and for the mothers in waiting, struggling with infertility and wishing they had a child to celebrate today. It’s a paradox of emotions today, knowing how many women are hurting and wishing that this day would pass quickly. Finding the words to respond to someone’s expressed sadness can feel daunting, or even inadequate. What can we ever say to a mother who delivered a stillbirth, or miscarried, or a mother whose child died just hours after birth? What words were we ever taught that could appropriately reflect our compassion or our understanding? Too often, people don’t know what to say or how to express their sympathies, especially when there is no opportunity for shiva or hespedim. Women who suffer perinatal loss struggle deeply with the absence of comforting words. For many, the loss presents before anyone even knows they are pregnant. These women’s losses are silent and isolating and deeply painful. My own mother, who became a motherless daughter at the age of twenty-five, is the one who modeled for me the way to respond to grieving individuals. When others backed away, she stepped forward and taught me how to “show up” in the face of tragedy. And so, on this day after Mother’s Day, I will share with you what I have learned from her, strengthening the support we can all provide for grieving mothers in our community. Don’t say nothing. Your silence is often worse than saying the wrong thing, especially when you have a close relationship with the grieving parent. Start with: “I am so very sorry for your loss,” and just sit with that. Just sit with it. Your presence is more important than your words. Ask if you can come over and spend some quiet time together. Bring a soup or a coffee and just sit with her. Keep showing up. Text or email words of support as opportunity for first contact only. “I am thinking of you” goes a long way. Try saying: “Hope you are having a gentle day,” or “Sending gentle thoughts to you” as a way to express compassion. Avoid suggesting that things will get better. Remember milestone events or days and acknowledge them in the future. Find ways to communicate that you remember even after the news of the loss is a part of the past. Challenge your inclination to send a sad or tearful emoticon. Just don’t. Trite responses are even harder for the bereaved to manage than no response at all. When circumstances allow, use the deceased person’s name in conversation, share a memory with the Mom that helps her know that her child is not forgotten. In a wonderful post by Heather Plett, she describes the practice of “Holding Space.” When a person is struggling on a difficult journey of grief and loss, there really is little that we bystanders can do to make it an easier experience. Our role as a bystander is to walk alongside that person without judgment or offering opinions. When we “hold space,” we allow our hearts to connect with a person in pain, offering a means for the individual to no longer feel alone. The unconditional support provides space for the bereaved mother to feel the hands of community wrap around her in a caring embrace for as long as she needs it. This may feel like we are doing nothing, but in the grief world, the act of being is all that is needed. Take a lesson from the shiva experience, where the bereaved are told to sit and we are told to sit with them, and find the courage to offer support and a kind word to the mothers – and fathers – who will deeply appreciate your sensitive and authentic Mother’s Day wishes. 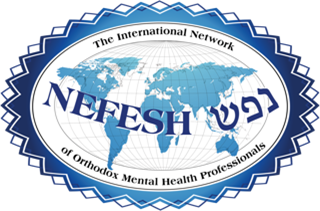 Dvora Entin, LCSW is the Director of JFCS Ma’oz in Philadelphia, a new initiative to engage the Orthodox community on mental health and family life issues. She moderates monthly support calls on perinatal loss (K’nafayim) and specializes in maternal mental health.